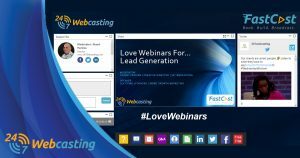 The design and banding of our webinar platform is completely customizable. No longer do you have to settle for layout or design restrictions. Make your webinars an extension of your own brand and website, based on your own corporate identity. Choose from over 30 in-webinar apps to give the users the experience they expect and arrange interactive elements in a way you want, not the way your webinar platform sets out. Our webinar platform has been pioneering the personalized and customizable user interface for many years. Each webinar attendee is in control of their user experience by using and arranging the webinar interface and apps you make available.